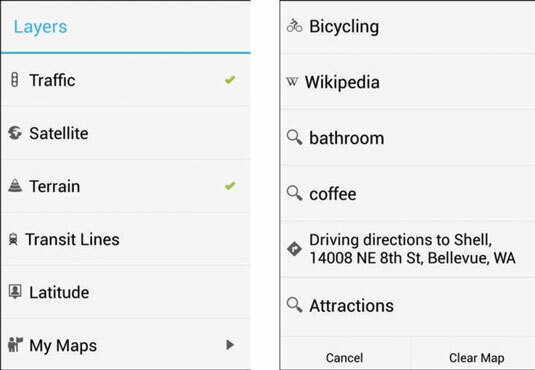 Using your map application on your Samsung Galaxy S 4, you can change the map scale as needed. A resolution of one square mile will work under some circumstances to help you get oriented in an unfamiliar place. But sometimes it helps to zoom out to get a broader perspective, or zoom in to help you find familiar landmarks, like a body of water or a major highway. To get more real estate onto the screen, use the pinch motion. This shrinks the size of the map and brings in more of the map around where you’re pinching. If you need more real estate on the screen, you can keep pinching until you get more and more map. After you have your bearings, you can return to the original resolution by double-tapping the screen. On the other hand, a scale of one square mile might not be enough. To see more landmarks, use the stretch motion to zoom in. The stretch motion expands the boundaries of the place where you start the screen. Continue stretching and stretching until you get the detail that you want. This figure shows a street map both zoomed in and zoomed out. The map on the left is zoomed in in Satellite view. The map on the right is zoomed out in Terrain view. A street image on the Galaxy S 4 zoomed in and zoomed out. The app gives you the choice of satellite view or terrain view by tapping the Layers button on the bottom right hand corner of the map. This brings up a pop-up similar to what is seen in this figure. 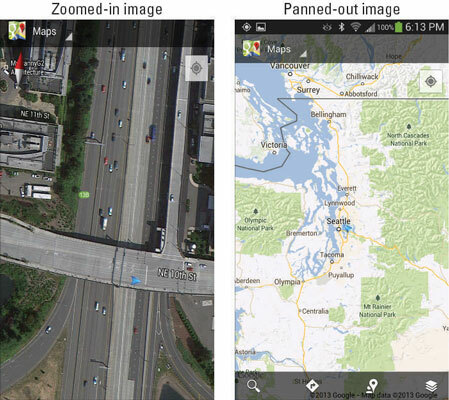 The Galaxy S 4 Map’s Layers pop-up. Bring up the Satellite view by tapping Satellite. You get the Terrain view by tapping Terrain. You can also bring up other views that are useful to you, including transit routes and bicycling paths. If you’re zooming in and can’t find where you are on the map, tap the dot-surrounded-by-a-circle icon. It moves the map so that you’re in the center.